From the very first screenshot, it was clear that Primordia was going to be a truly distinctive game, and the final game didn't disappoint. The debut effort from indie developer Wormwood Studios turned out to be quite good overall, but by far the biggest standout was its locale. Set not in Earth's own future, but rather on an alternate world with a fabled history of machine replacing man, the game uses a limited colour palette restricted almost exclusively to shades of brown and gold, but this post-apocalyptic sci-fi adventure combines a familiar retro aesthetic with wide-ranging artistic influences to create some absolutely unforgettable scenery and characters. It's more than just a simple backdrop; its dreary desolation is an essential component of a tale that couldn't be told anywhere else, and for that Primordia narrowly earns our Best Setting award over stiff competition. The once-proud city of Metropol and the radioactive desert wasteland around it are the very definition of beauty in decay. The struggle for survival of robots Horatio Nullbuilt (v5) and his floating sidekick Crispin in this harsh mechanical landscape is WALL-E by way of Alien and Dune, and it works exactly as well as that sounds. 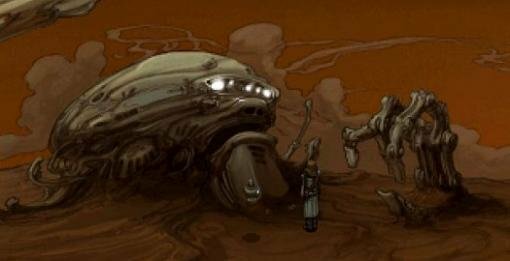 Ravaged by now-ancient nuclear war, the world that Primordia’s robots inhabit was once impressive in its grandeur but is now full of dilapidated buildings and dead robots half-buried in the sand. Even the vaunted “City of Light” is essentially a bunch of shanties stapled together into a raggedy analogue of Blade Runner’s endless cityscape. It’s a haunted world, one that oozes history far more detailed than the events laid out by the game’s exposition, and one that stuck with us long after we left it behind. In another tight race, it seems you were also tempted to choose the harsh post-apocalyptic environs of Primordia. But instead of the dreary browns of radiocative desert dunes, you went with the insanely cheery, surreal tree world of Amanita's Botanicula for top setting. A few giddy hours spent exploring with Feather, Poppyhead, Lantern, Twig, and Mrs. Mushroom proved a delightfully imaginative experience that made even fighting off invading parasites a joy to experience.